Tommy Chong is in disbelief after he was disinvited by the Bernie Sanders campaign from introducing the presidential hopeful hours before a rally in East Los Angeles. The iconic comic actor and outspoken marijuana advocate tells The Hollywood Reporter that the Sanders campaign was happy to have his endorsement months back, but when it came time for the two men to appear in public together, someone got "cold feet," he says. "It's lip service to get the votes, but they don't want to endorse what I stand for and what I've stood for all my professional career," Chong said right after he was uninvited to the rally. "It was an insult." In a email to THR, a Sanders spokesman said, "We appreciate his support but a scheduling issue came up." Chong, who was invited on Sunday to Sanders' noon rally in Lincoln Park, says he is sure the campaign put distance between himself and Sanders over the marijuana issue, calling the move a "weakness" by the Sanders' camp. He joked that his hair and makeup were done for nothing. 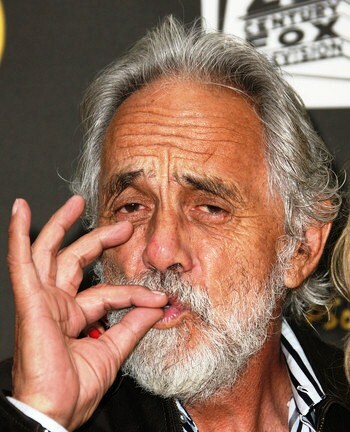 "Tommy Chong is in disbelief"
Tommy Chong, as in "Cheech and Chong"? Having that Tommy speak when Bernie was just having fun was fine. But now Bernie is sensing he just might be the last man standing. And after all this, he really wants to win the nomination! Tommy Chong won't help that. Now that Guccifer has cut a deal with the feds Bernie's wife is telling him to knock off the Chech and Chong stuff! They're both sensing that Bernie just may have a shot at winning this thing!